This combo unit with waterslide is GREAT fot those hot summer days!! This unit is great for ages 2-12. 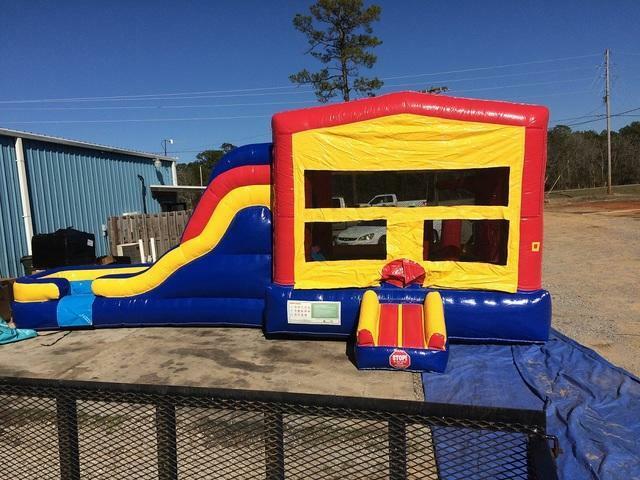 A combo is a bounce house with slide attached.Are you stuck between a bounce house rentals or a inflatable slide rental? This bounce house como rental is the best of both worlds! This combo is a bounce house with a slide attached to it! It is jam packed with fun! This is our most popular unit and it gets rented fast! We clean each unit after the rental and then again on site when they are delivered. We deliver all over the Mississippi Gulf Coast! 27L x 13W x 16H. Great for ages 11 and under. Large jump area along with an attached slide keeps kids happy for hours!! !